New fossils of Homo sapiens discovered at the Jebel Irhoud site in Morocco are the oldest remains of modern humans ever found, pushing back our origins 100,000 years. 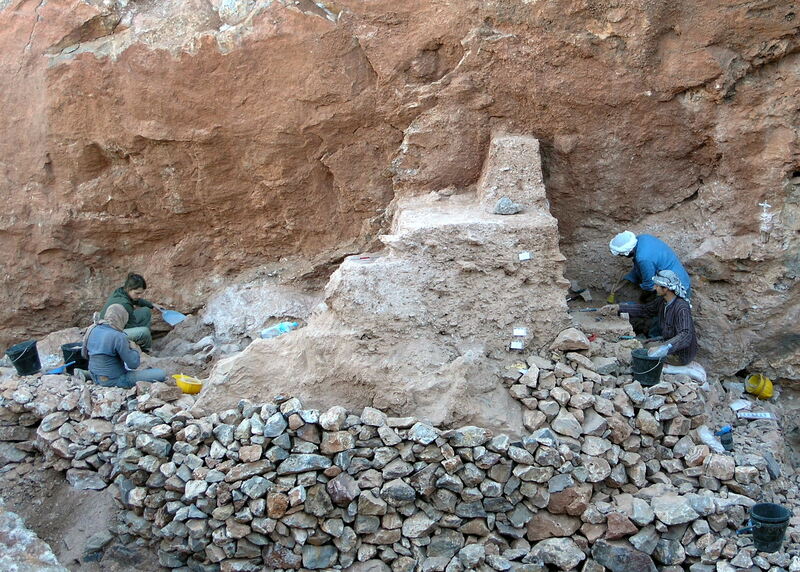 An international team of archaeologists and paleoanthropologists led by Jean-Jacques Hublin of the Max Planck Institute for Evolutionary Anthropology in Germany and Abdelouahed Ben-Ncer of the National Institute for Archaeology and Heritage in Morocco unearthed fossilized Homo sapiens bones and flint blades at Jebel Irhoud, a site that has been known for its Middle Stone Age remains and artifacts since the first fragments were discovered by miners in 1961. The team discovered pieces of the skulls, teeth and the long bones of at least five people. 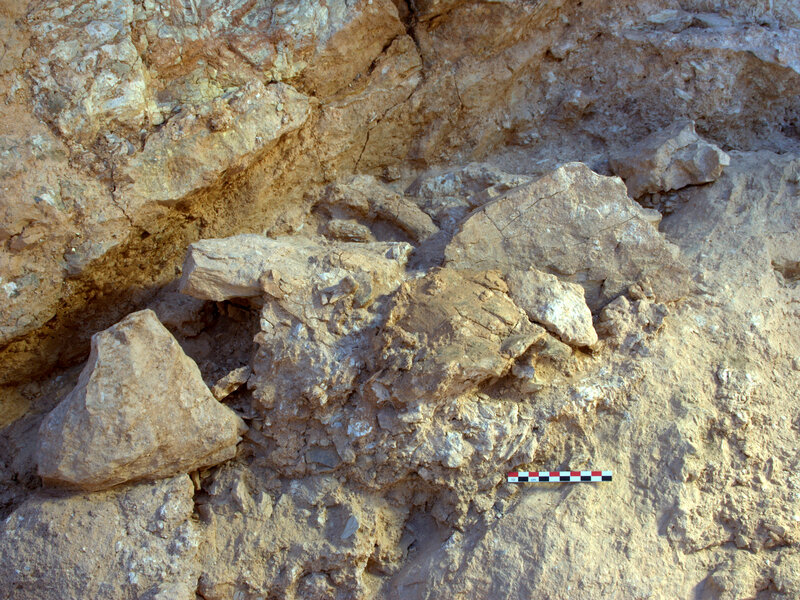 Dating previous Jebel Irhoud finds has been problematic, because they were not professionally excavated and dating techniques were crude and approximate. 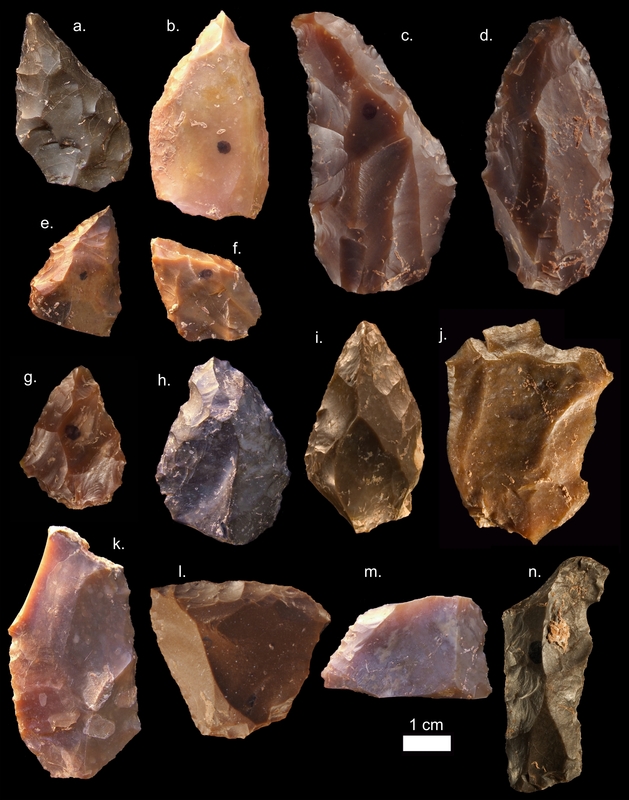 The discovery of fossils in situ, morphologically identifiable as Homo sapiens, and worked flint tools in the same sedimentary layer allowed the researchers to absolutely date the finds since all the people died around the same time as the tools were discarded. The flints had been burned, probably by cooking fires built above them. To get an exact date, researchers used the thermoluminescence technique on the flints which revealed they were burned approximately 300,000 years ago. “Well dated sites of this age are exceptionally rare in Africa, but we were fortunate that so many of the Jebel Irhoud flint artefacts had been heated in the past,” says geochronology expert Daniel Richter of the Max Planck Institute in Leipzig (Germany), now with Freiberg Instruments GmbH. Richter explains: “This allowed us to apply thermoluminescence dating methods on the flint artefacts and establish a consistent chronology for the new hominin fossils and the layers above them.” In addition, the team was able to recalculate a direct age of the Jebel Irhoud 3 mandible found in the 1960s. This mandible had been previously dated to 160 thousand years ago by a special electron spin resonance dating method. Using new measures of the radioactivity of the Jebel Irhoud sediments and as a result of methodological improvements in the method, this fossil’s newly calculated age is in agreement with the thermoluminescence ages and much older than previously realised. “We employed state of the art dating methods and adopted the most conservative approaches to accurately determine the age of Irhoud”, adds Richter. The crania of modern humans living today are characterized by a combination of features that distinguish us from our fossil relatives and ancestors: a small and gracile face, and globular braincase. The fossils from Jebel Irhoud display a modern-looking face and teeth, and a large but more archaic-looking braincase. 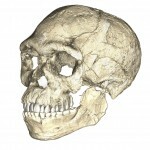 Hublin and his team used state-of-the-art micro computed tomographic scans and statistical shape analysis based on hundreds of 3D measurements to show that the facial shape of the Jebel Irhoud fossils is almost indistinguishable from that of modern humans living today. In contrast to their modern facial morphology, however, the Jebel Irhoud crania retain a rather elongated archaic shape of the braincase. “The inner shape of the braincase reflects the shape of the brain,” explains palaeoanthropologist Philipp Gunz from the Max Planck Institute for Evolutionary Anthropology in Leipzig. 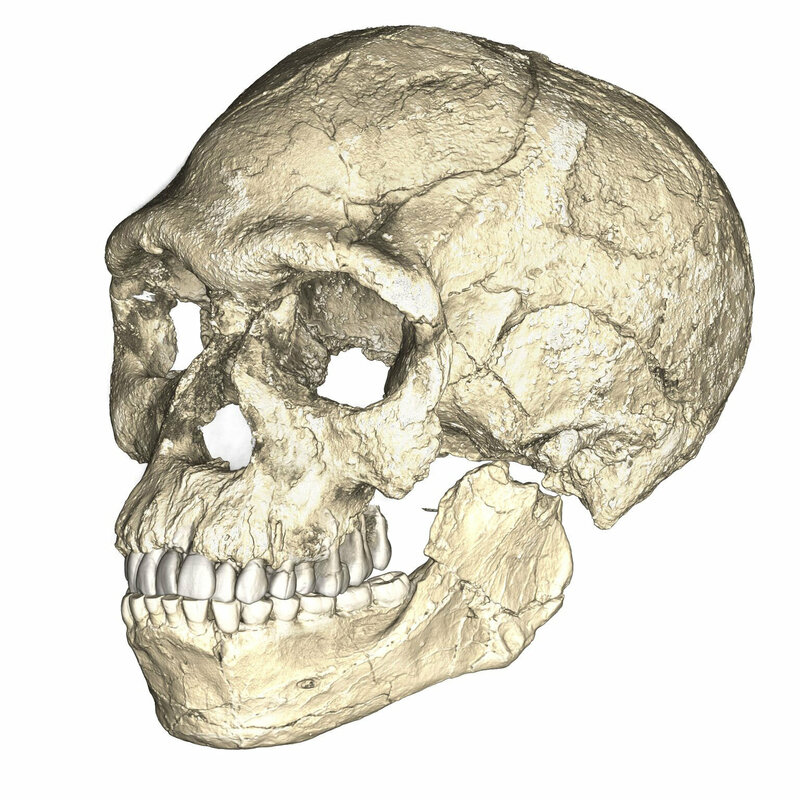 “Our findings suggest that modern human facial morphology was established early on in the history of our species, and that brain shape, and possibly brain function, evolved within the Homo sapiens lineage,” says Philipp Gunz. Before this discovery, the oldest securely dated Homo sapiens fossils were 195,000 years old and were discovered at the site of Omo Kibish in Ethiopia. Because the fossil record this far back is sparse and the few finds that have been made were centered in Ethiopia, researchers thought Homo sapiens may have evolved in East Africa, dubbed the cradle of mankind, and spread out over the continent from there. The Moroccan fossils are evidence that modern humans evolved elsewhere on the African continent as well, not just in Ethiopia and environs. A wealth of animal bones were also discovered that bore evidence of having been hunted. Gazelle bones were the most numerous, but these early Homo sapiens supped on a remarkable variety of species including wildebeests, zebras, buffalos, porcupines, hares, tortoises, freshwater mollusks, snakes and a smattering of small game. They were hunted with high quality flint tools — the flint was imported from a site 20 miles south of Jebel Irhoud, an indication of how capable this Homo sapiens group was of securing the best resources over long distances — and signs of butchering are evidence that people broke the long bones open to eat the marrow. The first study of the Jebel Irhoud finds has been published in the journal Nature. A second publication also in Nature focuses on the dating. They are both behind the subscription firewall, alas, but can be rented for a few bucks. 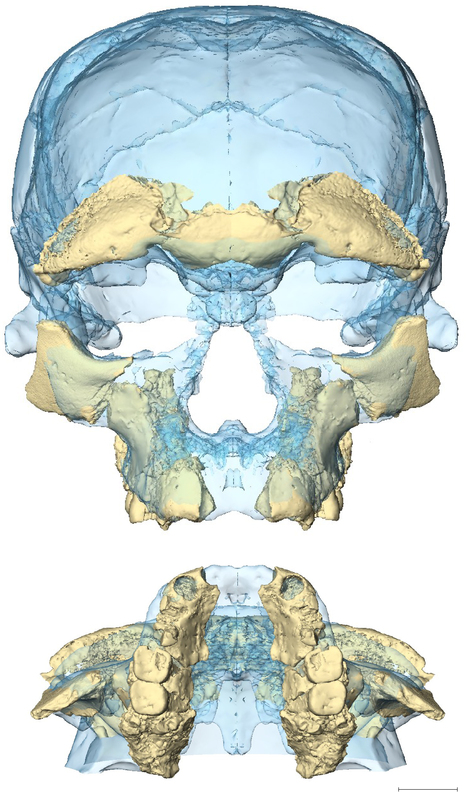 The Max Planck Institute for Evolutionary Anthropology has made two very cool 3D composite reconstructions of the earliest known Homo sapiens fossils using CT scans of the finds. You can see in the first video the different shape of the early Homo sapiens brain by the imprint of it in the blue-tinted braincase. The second video starts with a CT scan of a child’s mandible who was about eight years old at time of death. 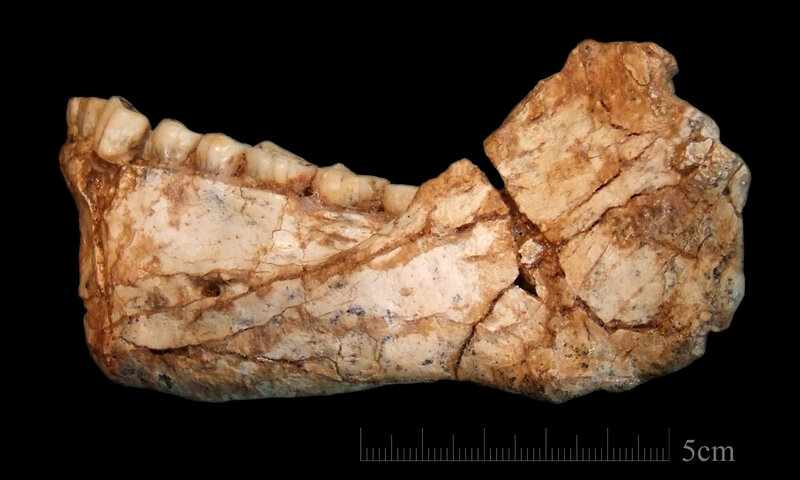 It then delves further into the skull and brain of the 300,000-year-old Homo sapiens. This entry was posted on Thursday, June 8th, 2017 at 11:59 PM	and is filed under Ancient. You can follow any responses to this entry through the RSS 2.0 feed. You can skip to the end and leave a response. Pinging is currently not allowed. Wonderful! Thank you for posting this! How exciting. But a couple of words of caution. First, presumably like any other science you’d want to see how it stands up to critical scrutiny by other workers, and whether any further evidence emerges to support it or refute it. Secondly, in the nature of things we presumably can’t know that any of us are descended from these chaps. Maybe they turned out to be a dead end. It would be wonderful if one could do DNA studies on objects that old but apparently one can’t. Yet. By the way, blogger, your account of this work is clearer than any I’ve seen in the papers. Congratulations and thanks. And another thing. Because until now it was thought that hom sap developed in Ethiopia it was inferred that he spread all over the world by crossing the Red Sea to Yemen and moving around the Asian coasts until reaching Australia and other distant places. But if he was also present in Morocco, what’s to stop him spreading by crossing the Med to Spain, or by spreading along the N African coast and across the isthmus into the Levant? Come to think of it, could hom sap have crossed the isthmus, then trailed down along the Red Sea coast to Yemen, and then have crossed to the Horn of Africa? Thank you for this exciting post. Umm, my Vice President Pence will have a problem reconciling this study with his 6,000 year old young Earth. Idiot! In Europe, 300k years ago, there were ‘Cave Lions’ (Panthera leo spelaea). Tiny mummified spalaea cubs from Siberia -that are at least 10k years old- were presented on this blog, now to be found under ‘archives/41075‘. PS: Earl, folk in public office tends to get mystical, as soon as it comes to numbers: 6*10^3 or 6*10^9 ? What does it matter, as long someone else will be held responsible ? Particularly, 'book money' is probably always a question of ‘belief’.